After much consideration, I decided NOT to start our capsule wardrobes with a suit, but I’m going to now pull in a second layer garment that can give you “suit-like” utility if you want it to. These two pieces could certainly be purchased as a true twinset (I personally adore twinsets), or you can find pieces that are closely related in color but not matchy-matchy. You can buy a cardigan without any buttons – a waterfall style – but make sure that it’s nice quality, and doesn’t look like “the cardigan that I keep on my desk chair all the time in case it gets cold in the office”. 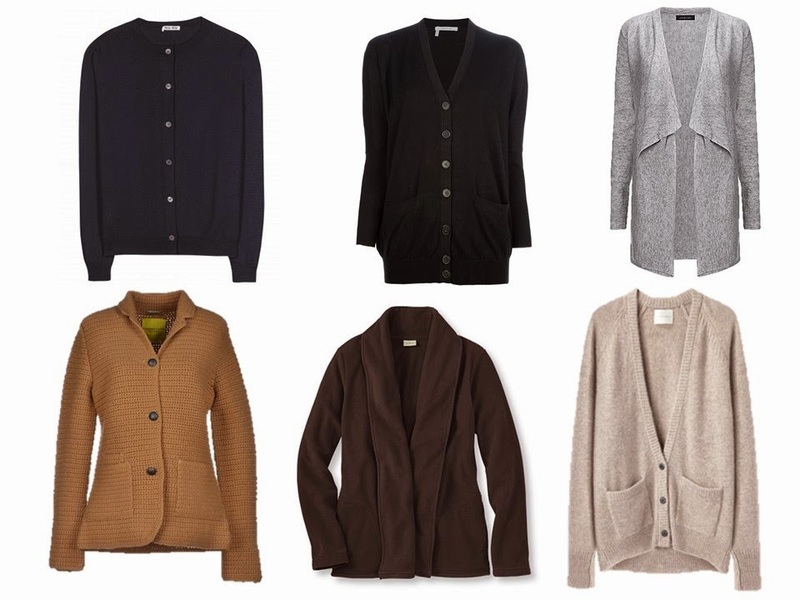 And do bear in mind that a cardigan that buttons can be worn without anything under it – as a sweater in its own right. A handy bit of versatility. Tee shirts can be cotton, silk, or synthetic blends (I’m a fan of modal, actually…) but as with everything, make certain that your new top fits ideally and is the very nicest quality you can find (or make…). For many of us, this is going to be an experiment in wearing the same color head to toe, and also in wearing a dark or neutral top near your face. There’s a lot to be learned from this; it’s important to gauge your comfort level with these things before we move forward and purchase or sew more clothing in our neutral color. Our wardrobes are starting to come together! For me this is one of the most informative series since the 'Common Wardrobe' and that is saying something. Nicely done, Janice, and have a lovely weekend. Wie schaffst Du das bloß? Just when I think i'll be first to post, you beat me to it! LOL! Are you back in Germany? Loving how these capsules are coming together. Especially loving the last one in light neutral. Is it just me and my tablet, or does beige/ oatmeal/khaki all fit? Watching these wardrobes unfold with delight and instruction…. These have been great posts Janice! I'm enjoying this series! I'm finding my eye drawn to the bottom two capsules especially! As I go through the your wardrobe planning and my closet culling, I am a little confused. I could put together this look in brown or khaki quite easily with existing items but my new grey hair might actually look best with the silver grey. Five years ago, I had colours done and was definitely an "autumn". I might really be starting from scratch. I will go to a shop and try a head-to-toe grey outfit just for fun! Grey will be your best option with your hair….I find it flattering and get the most compliments when I wear it now. These 3 posts are incredible,thank you.It seems you read our thougts.Yesterday when I read about shoes I wanted to ask you to write about cardigans,some tops.I work in office,but I don`t like tailored jackets.So this post was as a great surprising present! I am glad to see that you mentioned spending some time evaluating whether you actually like to dress in the same color head-to-toe. I have learned in the past few years that I am definitely uncomfortable doing so. I much prefer to have some contrast in my outfit. This is my uniform for fall and winter…a great fitting pair of pants, in my case dark denim jeans as I am now retired, a tee shirt and a cashmere cardigan. I have several grey cardigans which compliment my natural grey hair since I stopped having it coloured. Your series is very inspiring and it took me years to figure out my style…if only I had this information years ago I would not have made so many fashion faux pas! I am still reading faithfully, just not commenting. I, too, am finding this very helpful and plan to use your process and advise for a new beginning in the Fall. Very interesting. I must say I was surprised that a jacket didn't feature in the first 3; but I think you are right. These days good knitwear is fine in most work environments, yet can also be worn elsewhere. Wearing jackets every day to work is tedious, and becomes a uniform – it's nice to vary it with a slightly more relaxed feel. I have too many jackets, and have neglected quality cardigans and especially tees – it's to be given such a helpful steer! Such a great series! Has anyone else found that camel is a difficult color to shop for online? If you search navy you get some shade variation but everything is solidly navy. Search camel and you get every shade between bisque and mahogany. Yes it is driving me crazy and making me 2nd guess my color choice of caramel. I find wearing the same dark/neutral colour all over is not too flattering to my skintone or pearshaped figure. However I address this by adding a chunky pearl or goldtone neckace or even a lovely scarf. Does anyone know where I can find a loose-fitting, button-down cardigan that can be worn on its own? I had one that was almost perfect but alas, my pet rabbit chewed through the arm. It's been discontinued at the store I originally bought it. Black would be perfect. Thank you! I don't know if this will work for you, but since so many cardigans are made to fit snugly, I buy them one or two sizes larger than the size charts say. I love Lands' End, but their cardigans tend to be very snug. I've had to go up two sizes on all of their sweaters to get the fit I want. I adore all the lovely pieces esp. the cardigans. Cashmere clothing that is comfy to wear and good quality too. yes, sweater suits. i have one actual suit in a dark grey for the every-6-month-meeting with upper management and sweater suits for everything else. one shop had nice tanks and simple sweaters in several colors – not twin sets, but same dye. I snatched them up, pronto!